According to the United States Holocaust Memorial Museum, Yom Hashoah which falls on May 2nd this year, is observed in honor of the anniversary of the Warsaw Ghetto Uprising which began on April 19, 1943. According to the Museum, the United States has an official eight-day period, known as Days of Remembrance of the Victims of the Holocaust, that begins the Sunday before Yom Hashoah. The U.S. Holocaust Memorial Museum is mandated by Congress to lead this national observance in America. The 8 Days of Remembrance this year will begin on May 1st. On the Hebrew calendar, April 19, 1943 was the 14th of Nissan – the day before Passover, a very important and happy holiday. Orthodox Jews objected to this date for a Holocaust Remembrance day. The 27th of Nissan was chosen instead for Holocaust Remembrance because this date falls beyond Passover but within the time span of the Warsaw Ghetto Uprising. The infamous Dachau concentration camp was liberated on April 29, 1945 by the 42nd Infantry Division, along with the 45th Infantry Division, of the US Seventh Army. Yesterday, on the 66th anniversary of the liberation, newspapers were filled with the stories of 42nd Division veterans who recalled the the horror of what they saw and did that day. The photo above shows the bodies of Dachau guards who were killed at Tower B on the day that Dachau was liberated. 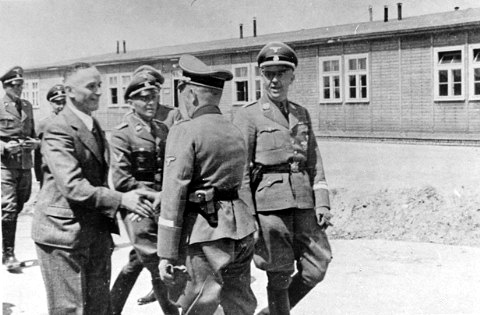 The shooting of disarmed German soldiers during the Dachau liberation was investigated by the Office of the Inspector General of the Seventh Army. Their report was finished on June 8, 1945 but was marked Secret. The report was eventually made public, around 40 years later, and a copy of it was reproduced in Col. John H. Linden’s book entitled Surrender of the Dachau Concentration Camp 29 April 1945. Here are four paragraphs from the report which pertain to the shooting of the guards at Tower B. On the day that Dachau was liberated, white flags had been flying from all seven of the Dachau guard towers since 7 o’clock in the morning, according to Nerin E. Gun, a Turkish journalist who was a prisoner at Dachau. 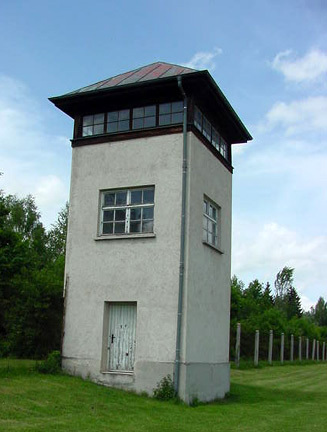 When American soldiers of the 42nd Infantry Division first entered the prison enclosure of the Dachau concentration camp, eight SS men descended from Tower G, the one closest to the gatehouse, and then surrendered with their hands in the air. One of the guards in Tower G was an SS man named Stahl, who survived to tell the story. Eight guards from Tower A, which is on top of the gatehouse, then came down the stairs and surrendered to the Americans. 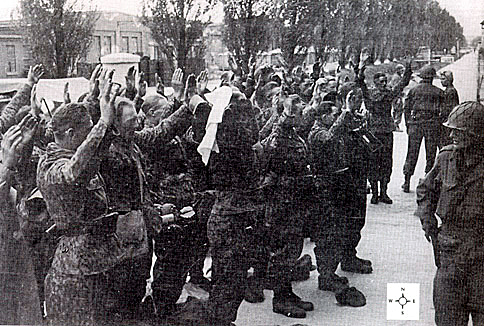 The photo below shows the Waffen SS soldiers with their hands in the air after they had come down from the towers. 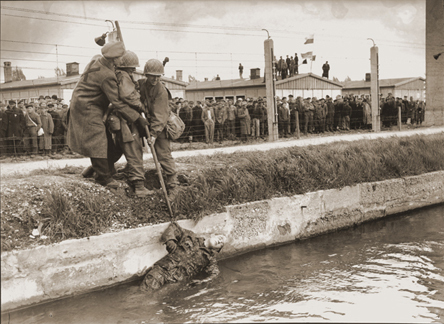 The dead bodies of some of the guards from Tower B were thrown into the canal which borders the western side of the Dachau camp. American soldiers continued to shoot at the bodies. The photo below shows one of the bodies being pulled out of the canal. Victor Maurer, a Red Cross representative from Switzerland, had arrived at the Dachau prison compound on April 27, 1945, two days before the liberation. Maurer had tried to persuade Obersturmführer Johannes Otto, the Adjutant to the last Commandant, Edward Weiter, to leave guards in the towers in order to secure the camp until the Americans arrived, but most of the regular guards left on April 28th, along with Martin Gottfried Weiss, the acting Commandant. The Commandant of the camp, Eduard Weiter, had already left on April 26th with a transport of prisoners headed toward Austria. 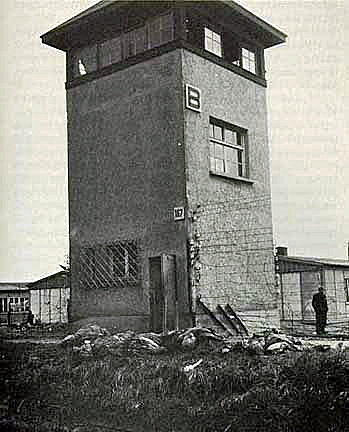 Finally, Maurer convinced SS 2nd Lt. Heinrich Wicker not to abandon the camp, but to leave guards posted in the towers to keep order until the prisoners could be turned over to armed American soldiers. Wicker was in charge of a group of SS men who had recently arrived at Dachau; they were former guards in three sub-camps of the Natzweiler-Struthof camp in Alsace. The guards, who were gunned down by Wells and the other American soldiers, had only been at Dachau for a few weeks and they were, in no way, responsible for the conditions in the camp. You can see a color video of the liberation of Dachau here. When Dachau was liberated by the American Seventh Army on April 29, 1945, most of the German guards had fled the night before, and mounds of unburied corpses were found in the camp. There were also 2,310 bodies found on an abandoned train outside the camp. Everything was left untouched until newpaper reporters, American Congressmen and film makers could be brought in to document the horror. Burial began on May 13, 1945 after the bodies could no longer be kept on display because they were beginning to constitute a serious health hazard. 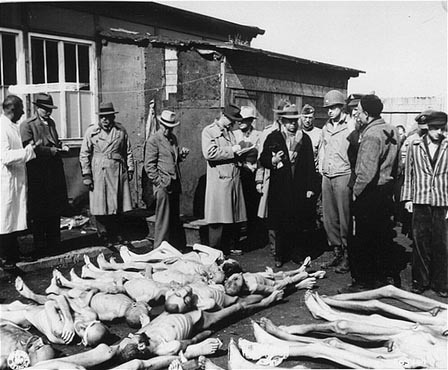 The photo above was taken on May 3, 1945, the same day that a film of the Dachau gas chamber was made; the film was shown at the Nuremberg IMT as proof that the victims at Dachau had been gassed. If there is no hell, will Adolf go to heaven? I was planning to write today about the ship St. Louis, which was carrying Jewish passengers to Cuba. When the passengers were turned away, the St. Louis then docked in an American port but the Jews were not allowed to enter the United States. Then I read a comment made on this post that I wrote a year ago, and decided to update it. MONROE — For several weeks, ninth graders at Monroe High School had been assigned to read Elie Wiesel’s memoir Night. The book Mr. Wiesel penned more than 50 years ago was used to introduce the approximately 300 students to the atrocities of the Holocaust. Last week, they learned about multiple facets of one of history’s darkest chapters, with some of them getting a firsthand account from a woman who lived through it. Over a one-hour period, students were jammed standing up into a space that simulated a railroad car. They tasted cabbage and bread, the typical meal given to Jews in concentration camps. In one class, they learned of the staggering number of people killed. Mr. Wiesel’s book, required reading for the ninth graders’ English class, and the classroom sessions were for Holocaust Remembrance Day on May 1. Deborah Mau, an English teacher who helped organize the program, said the main focus was to have students delve deeply into the Holocaust and World War II. “This gives them a lesson on tolerance and recognizing that not everyone has to look like you and to accept people for their differences and uniqueness,” she said. Nine segments ranging from stories about Holocaust survivors to slides on Dachau to poetry and Jewish holidays were available. Students could attend three sessions. I am sorry that my criticism of the Monroe High School program offended anyone, but I truly feel that students in the 9th grade should not be taught about the Holocaust in this way. First of all, Elie Wiesel’s book Night should be taught as literature, not as a way to “introduce students to the atrocities of the Holocaust.” The atrocities in the book Night are fiction, and the book should be taught as fiction. Babies were not thrown, alive, into a burning ditch at Auschwitz, and students should be told that this atrocity did not happen. 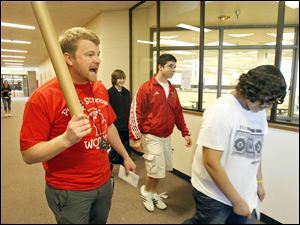 Mark Scoles, left, conducts a “Remembrance Walk” through the hallway in which a march to the death camps is reenacted during an afternoon of Holocaust Remembrance activities. 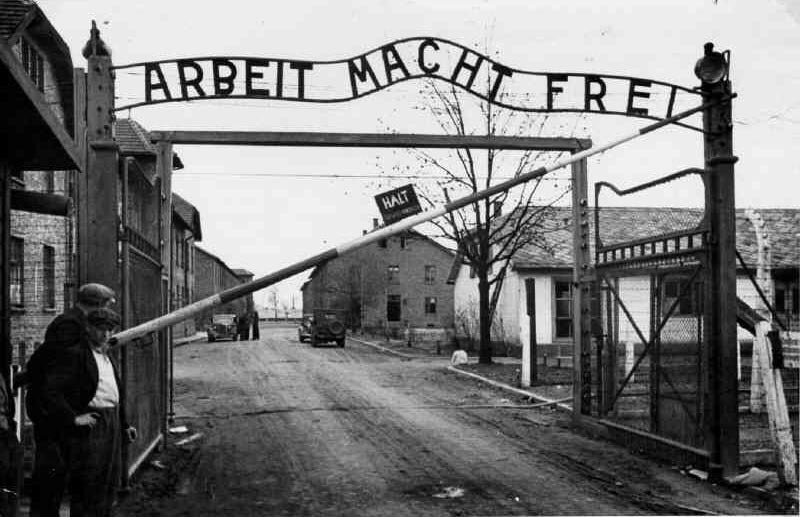 The students who were on the pretend “march to the death camps” should have been told that prisoners were marched OUT of the death camps, not TO the death camps. They were marched out to get them out of a war zone and into a safer camp. The purpose of these marches was to save the lives of the prisoners, not march them to their death. Elie Wiesel volunteered to join the march out of Auschwitz and was then taken to the Buchenwald camp where he survived. The students, who were fed cabbage and bread, should have been told that Heinrich Himmler, who was in charge of all the concentration camps, had a degree in Agriculture and he was growing cabbage, using the method of organic gardening, which was pioneered by the Germans. The bread given to the prisoners was whole grain bread, not the fluffy white bread that Americans were eating during World War II. The students should have been told that food was rationed in all countries during World War II, including America. The students, who had to stand for an hour in a crowded space, should have been told that, during World War II, there was a scarcity of trains and even upper class German citizens were riding in cattle cars. 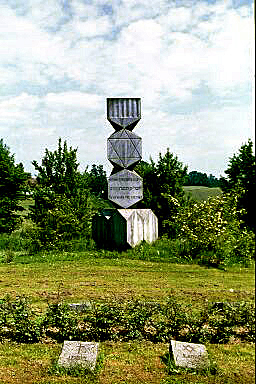 These students were taught “a lesson on tolerance and recognizing that not everyone has to look like you and to accept people for their differences and uniqueness.” Teaching tolerance is fine, but it is wrong to tell high school students that the Jews were deported to camps because of “intolerance or differences or uniqueness.” This is a touchy subject that might be too offensive to teach in the 9th grade, but the students should at least have been told that one of the main reasons that the Jews were kicked out was because Hitler, and many of the German people, thought that the Jews were responsible for causing Germany to lose World War One. The students should have been taught that the “staggering number of people” who were killed is unknown. The numbers keep changing and there are no records to prove the “staggering number.” The “staggering number” of people killed in the Holocaust should be taught in context with the number of non-Jews killed during World War II, who were not in concentration camps. The students should have been taught that the reasons for genocide vary from one country to another, but there is always a reason that a group of people are targeted. Genocide is not caused by intolerance or racism or differences between people. Jews have been targeted for thousands of years, in many different countries, and it is not because of their religion. The students should have been told that there were “internment camps” in America where Japanese-Americans, citizens of Germany, and German-Americans were imprisoned in violation of the American constitution. German-Americans, who had not committed any crime, were kept in these camps for two years AFTER the war. German citizens were kidnapped in South America and brought to America to be put into the internment camps. 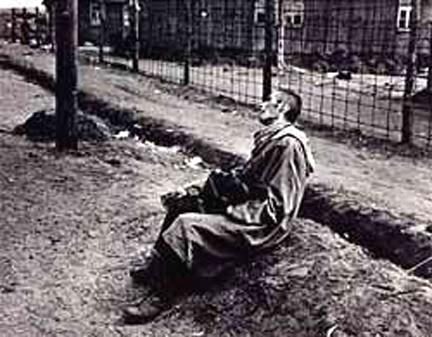 According to a news article on the Toledo Blade website, 9th graders in Monroe, Ohio are spending several weeks learning about the horrors of the Holocaust in preparation for Holocaust Remembrance Day on May 1st. How many Holocaust Remembrance Days are there? Enough, already. What would Anne Frank have written if she had continued writing in a diary after her hiding place was found? April 20th is an important day in history. On this day in 1945, American soldiers of the 3rd, 42nd and 45th Infantry Divisions of the US Seventh Army were celebrating their conquest of Nürnberg, the most German of all cities, considered to be the capital of German nationalism, and Hitler’s favorite city. Where Hitler’s soldiers, a hundred thousand at a time, had once goose-stepped past the reviewing stand at the Zeppelin Field in Nürnberg, American soldiers were doing a victory march on April 20, 1945 and mocking Hitler with a stiff-armed salute from the speaker’s platform. The title of my blog post today is a line spoken by Yanina Cywinska in a video which was shown recently on a TV program. Yanina Cywinska is an 82-year-old woman, now living in Concord, CA, whose Holocaust survivor story is in a book called The Sugar Plum Fairy Nut. In the book, we learn that she survived the gas chamber at Auschwitz. She lived in the Auschwitz camp for four more years before being sent on a death march to Dachau where she was liberated by Japanese soldiers in the 552nd Field Artillery Battalion. You can read about the 552nd on my web site here. Yanina Cywinska was just 11 years old when she arrived at Auschwitz, where children under the age of 15 were sent immediately to the gas chamber. She was actually inside the gas chamber and the people around her were dying, but she survived because the gas was carbon monoxide. According to her story, the Nazis had not yet started using Zyklon-B at Auschwitz. A woman prisoner pulled her out of the pile of bodies and sneaked her into a work group. In the video, she mentions that a Nazi was standing in the corner of the gas chamber, watching the people die. The title of Yanina Cywinska’s book is a reference to the name that the other prisoners at Auschwitz called her: “the Sugar Plum Nut.” The women at Auschwitz thought that Yanina was a “nut” because she dreamed of becoming a ballet dancer and dancing as the Sugar Plum Fairy ballerina in the Nutcracker. As it turned out, she made it, so eat your heart out, Hitler. Yanina had already had three years of ballet training before she was sent to Auschwitz in 1941, and as luck would have it, her ballet teacher was living in Paris after the war. Yanina was just 15 when she was liberated from Dachau. She made her way to Paris, where she moved in with her ballet teacher and resumed her training. In the video, Yanina says that the Nazis were trying to kill as many people as possible to eliminate witnesses, and just before soldiers arrived to free the inmates at Dachau, the prisoners “were lined up to be shot.” But before the Nazis could shoot all the prisoners, the Japanese soldiers in the 552nd Field Artillery arrived in the nick of time. She had been born in Poland and raised in Warsaw. Her father was a doctor. After Germany invaded and they were living in occupation, her father was summoned to treat a high-ranking German officer inside the Warsaw Ghetto, where 500,000 Jews were barricaded in an area of only several city blocks. He was so appalled by the living conditions that he began smuggling food into the starving inhabitants. He was caught and he and his wife and children were loaded into railroad boxcars, along with the Jews from the Ghetto, and sent into the countryside. When the train stopped and the people were herded out they were in a barbed wire prison. They were sent to get showered so they could begin to work. The doors to the shower chamber were closed, then the gas began to come out of the vents. When Yanina awoke she was lying among a pile of corpses, among them her family. Amazingly, she was still alive. A Jewish woman worker shook her to her feet and pressed her to work in one of the working gangs. 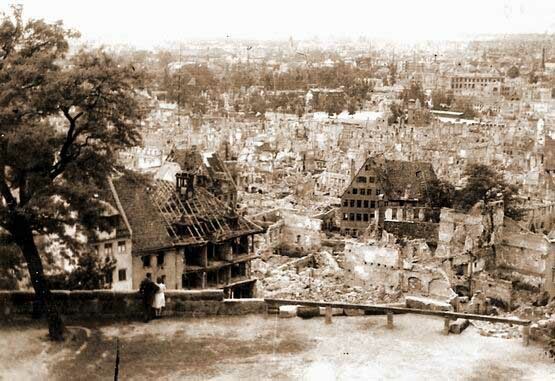 You can read about the Warsaw Ghetto on my web site here. You can read here about the Jews being sent from the Warsaw Ghetto to be gassed with carbon monoxide. The video about Yanina shows a photo of the Auschwitz gas chamber; you can see photos of the Auschwitz gas chamber on my web site here. P.S. Yanina’s book is available on Amazon.com. I buy lots of books on Amazon and I always get suggestions for other books that I might like. The suggested books are listed as books purchased by other customers who have bought this book. I have some suggestions for people who buy Yanina’s book: Dennis Avey’s book and Irene Zisblatt’s book. BTW Yanina’s book has the “Search Inside” feature on Amazon. I used the “Search Inside” feature on the Amazon web site and read a few pages of Yanina Cywinska’s book. I discovered that the book was first published on January 7, 2008. It was not written in the first person, so the real author is apparently a ghost writer. I have hope that some day there will be a law against Holocaust lying, and Yanina will be carried into a courtroom on a stretcher to be prosecuted for her lies. I am assuming that the ghost writer just wrote down the lies, as told to her by Yanina. But the ghost writer should also be prosecuted as an accessory to the crime of Holocaust lying. Just reading a few pages of this book made me extremely angry and upset. I wish I had not turned on my computer today.